In the world of email, a short list of companies dominate–Google, AOL, Yahoo, Microsoft–but there’s a new player in the game that’s ready to tear down their firewalls: Ronald Reagan. In the world of email, a short list of companies dominate–Google, AOL, Yahoo, Microsoft–but there’s a new player in the game that’s ready to tear down their firewalls: Ronald Reagan. Just as Reagan took on Walter Mondale and Jimmy Carter, the conservative icon’s family isn’t about to bow down to any lily-livered liberals, be them presidential candidates or billion-dollar tech giants. Last year, in his father’s memory, Reagan’s son Michael launched an email service to end the monopoly of left-wing Internet companies. His charge was simple: “Every time you use your e-mail from companies like Google, AOL, Yahoo, Hotmail, Apple and others, you are helping liberals,” Reagan wrote at the time. “These companies are, and will continue, to be huge supporters financially and with technology of those that are hurting our country.” For only a small $39.95 annual fee, conservatives around the country could purchase an @Reagan.com email address, and rest easy knowing their money was going only toward conservative causes. 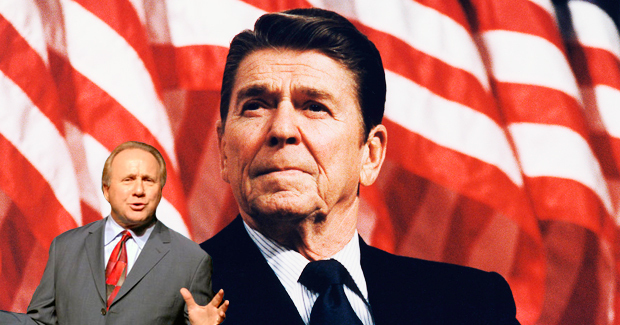 Today, on the eve his late father’s 100th birthday, we caught up with Michael Reagan to find out how the hot startup was faring–and how he planned to win this one for the Gipper. As Reagan tells it, the service is flourishing. With little marketing, Reagan Email is growing, and on the path to becoming a big threat to Google, AOL, and others. When I asked how a $39.95 service could ever compete with Google or Microsoft’s free email, Reagan explained that once he gets enough users, he too will be able to offer free, ad-supported service. After all, it’s no different than how his competitors began. So will Reagan Email soon chomp away at the market share of Gmail and Yahoo and Hotmail? For $39.95, there’s no telling how big this service could become. Well, look who’s laughing now. Follow me, Austin Carr, on Twitter.